Translation competence was defined as the underlying system of knowledge and skills needed to be able to translate. 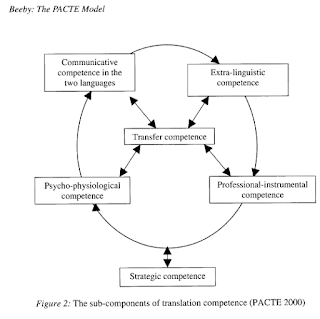 The researchers reviewed many models of translation competence and concluded that their model of translation competence includes a strategic component and a psycho-physiological component. They also proposed six sub-competencies: communicative, extra-linguistic, professional-instrumental, transfer, strategic and psycho-physiological as shown below. The researchers opted for an empirical research in order to validate their suppositions about translation competence and isolate the sub-competencies through systematic observation and data collection. PACTE decided to follow a deductive approach formulating closed hypotheses ( one on translation competence, and the other on the acquisition of translation competence. These hypotheses can be verified or nullified by the results of empirical-experimental observation. PACTE wanted to design an empirical-experimental research model to confirm or adjust their hypotheses and allow them to proceed deductively. The model had to combine quantitative and qualitative data that has a real and practical application for human translators and integrates both theory and practice. The PACTE Group research designed an experiment to measure (1) translation competence, and (2) acquisition of translation competence. For the first group, subjects were divided into groups; experimental group, (professional translators) and control group (bilinguals, non-practicing translators). For the second group, two experimental groups were used; one comprising translation students and the other of professional translators. A commercial software programme (PROXY) used for remote control of computer users logged onto a server where all the translator's activities - Internet search, CDs encyclopedia or dictionary searches, pauses, corrections, etc. - can be logged in real time and the translator's screen can be observed on another computer in another room. The design included two questionnaires and one interview: (i) an initial questionnaire to elicit information about professional experience, direct/inverse experience, training, ideas about translation and translation competence. (ii) A final questionnaire to gain more information about the translator, the problems in the text, the strategies used, and their own evaluation of their translation. (iii) Retrospective interview with the translators following the PROXY recording. Subjects were asked to translate two short texts, one of which is translated directly (i.e. into the Ll and the other inversely (i.e. into L2), and the whole process is recorded on PROXY. Beeby, A. (2000). 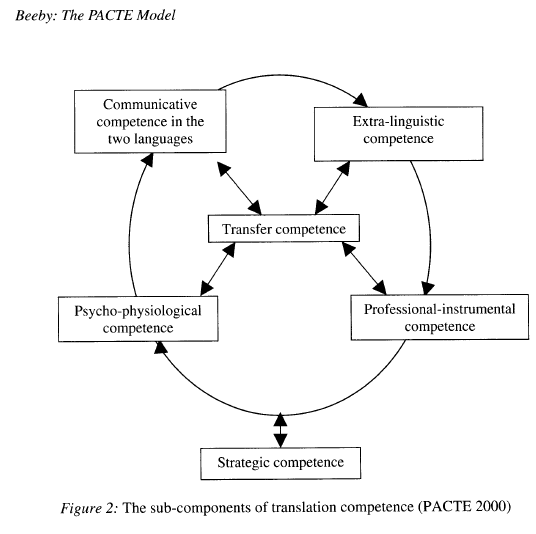 Choosing an empirical-experimental model for investigating translation competence: The PACTE model. Intercultural Faultlines. Research Models in Translation Studies I. Textual and Cognitive Aspects, Manchester: St Jerome, 43-55.